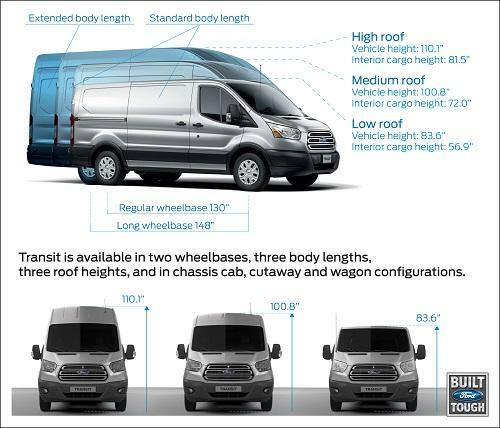 The all-new 2015 Ford Transit is leading the transition from the E-Series to Ford’s latest commercial vehicles. Last December, over 10,000 units were sold in the U.S. market, making the Transit the best-selling full-size van that month. Ford also took third place as well, with E-Series sales over 5,250 units sold. South Bay Ford Commercial is proud to be part of that success story. Based in Hawthorne, CA, South Bay Ford is an expert Ford Business Preferred Network (BPN) commercial dealer. South Bay Ford has been the largest Ford commercial dealership for the past 20 years and is number one in sales west of the Mississippi. It’s not surprising it has been the recipient of nine President’s Awards by the Blue Oval in exceptional customer satisfaction in both Sales and Service. Collectively, South Bay Ford has over 100 years in combined experience in the industry. South Bay Ford Commercial proudly brands itself a one-stop shop in the sale, upfit, and delivery of custom Ford commercial trucks and vehicles. The Ford Transit, like its predecessor the E-Series, is ideal for South Bay Ford clients to customize to their specific wants and needs. The Transit is offered in three body lengths and roof heights; two wheelbases; and in chassis cab, cutaway body, van and wagon body styles. There is over 487 cubic feet of cargo room in the large Transit Cargo Van. That is more than twice the volume of the standard E-Series and nearly 80 percent more space than the largest E-Series van. The interior is highly configurable and can easily accommodate bins, racks, shelving and other cargo storage and hauling equipment. South Bay Ford Commercial is involved in a variety of commercial areas such as linen, bakery, food, tow and refrigeration. In fact, South Bay Ford is the largest distributor of commercial flatbed tow trucks and refrigerated vans in the U.S. Unlike many competitors, South Bay has over 100 vans like the Ford Transit in stock, ready for buyers to examine on-site and place an order. Once that order is complete, it can be shipped anywhere in the contiguous U.S., courtesy of South Bay’s Nationwide Delivery program. This is especially true in the delivery of FedEx vans. Commercial experts at South Bay Ford Commercial work closely with clients to ensure their vehicle fits the exact specifications for their fleets. South Bay only uses the best in van equipment upfitting to build those vehicles. Adrian Steel, the first and only such equipment manufacturer to obtain a Ts16949 certification, provides shelving and modules to organize cargo within the van. Specialized package are even offered for electricians and locksmiths. Kargo Master, which is part of the Ford Truck Commercial Connection program, offers similar equipment as well as over 40 years of experience. Ranger Design offers quick-shipping of its steel and aluminum packages for various trades, while Masterack backs its products with a three-year/36,000 mile warranty. South Bay Ford Commercial also offers options for those customers looking to make their fleet more environmentally friendly, specifically alternative fuels. South Bay Ford will equip your vehicle to use Compressed Natural Gas (CNG) or Liquefied Petroleum Gas (LPG), also known as propane autogas. Both powertrains release fewer pollutants and greenhouse emissions into the atmosphere than the standard gasoline and diesel engines. And they are less costly as well: CNG costs $2.00 less per gallon compared to gas and diesel. LPG offers similar saving benefits while matching the mileage of gas engines. Another advantage is that since both alternative fuels are processed and distributed in the U.S. instead of overseas, they reduce dependence on foreign sources of oil. Finally, South Bay Ford Commercial knows its customers rely on their vehicles like the Ford Transit for their livelihood. Time spent in the shop for repairs or even simple maintenance means loss of revenue opportunity. South Bay, thus, has a dedicated fleet service center open from Monday through Saturday. Nearly 140 bays are available and manned by master-trained, Ford-certified technicians. A pick-up and delivery service is offered where drivers pick up customer vehicle(s) that need servicing and bring them back. This is a very convenient way to get customers back on the road quickly. Also important is that many Ford commercial vehicles are built from the components of other Ford vehicles. The Ford Transit borrows its engine from the F-150 pickup truck, for example. This makes it both quick and easy to replace parts of Ford commercial vehicles, while competing models have to wait for theirs to be shipped in. 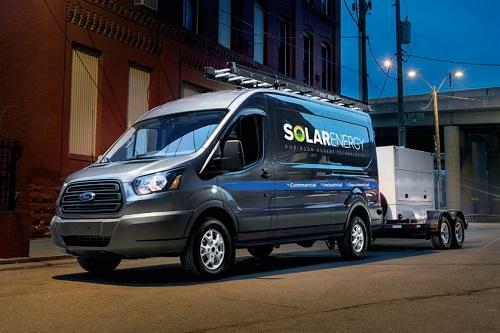 Ford has long dominated the commercial van space with its E-Series and looks to continue doing so with its replacement, the 2015 Ford Transit. South Bay Ford Commercial prides itself in the sale, upfit and service of Ford vehicles in the U.S. with its award-winning sales staff, supportive commercial experts, and dedicated fleet service center. South Bay Ford is your one-stop shop for all Ford commercial trucks and vans.